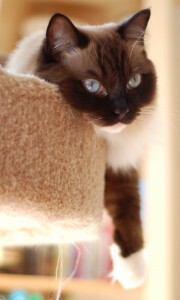 Lilly is a Ragdoll (a breed of cat that goes limp when you pick them up) and she is the darling of our household. She joined our family just before Easter four years ago, and since Lily’s are popular during that time of year and we wanted a feminine name, we thought that naming her after the flower would be perfect. Lilly is very affectionate and loves to be with us all the time. She’s a lot more vocal and adventurous than the average Ragdoll and it’s not unusual to see her climbing to the highest ledges and shelves in the house. When we first got her as a kitten, she was a Maniac…and I say that with a capital ‘M’! Our household was turned upside down as she tore through it, terrorizing our other cat and destroying the curtains. We thought that we would have to return her to the breeder, who kept saying “don’t worry, she’ll calm down.” To be honest, we didn’t really believe her, but at some point, Lilly did calm down – and now we can’t imagine our lives without her!